TOKYO, April 18, 2016 - Four Canon cameras and one Canon printer were recognized with “Best Photo and Imaging Product” awards by the Technical Image Press Association (TIPA), representing 30 photo and imaging magazines from 15 countries across five continents. 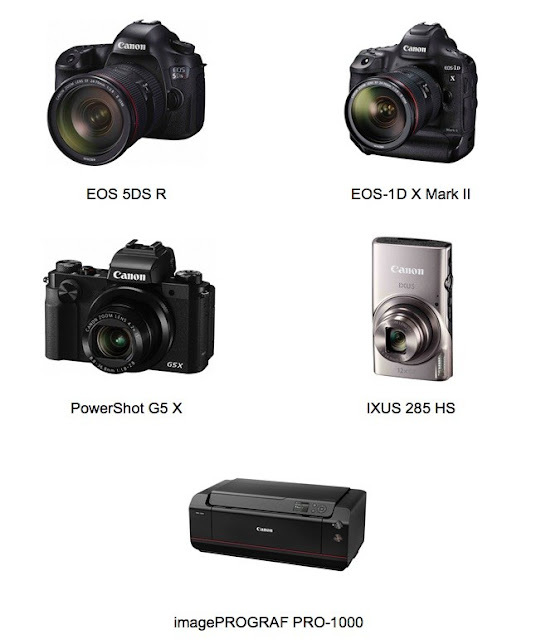 The five award winners are: the EOS 5DS R digital SLR (DSLR) camera, the EOS-1D X Mark II DSLR camera, the PowerShot G5 X digital compact camera, the IXUS 285 HS (PowerShot ELPH 360 HS in the Americas) compact digital camera, and the imagePROGRAF PRO-1000 professional inkjet printer. Named “Best DSLR Professional / High Res,” the Canon EOS-5DS R features an “impressive” approximately 50.6 megapixel full-frame sensor that the TIPA jury noted rivals those of larger medium-format digital cameras. The judges also highlighted the camera’s 5 frame-per-second (fps) continuous shooting of full-resolution still images and Full HD video capture at 30 fps. The EOS-5DS R is equipped with Dual DIGIC 6 image processors, a newly developed mirror vibration control system and time-release lag settings to further suppress camera shake and allow the camera to realize the full potential of its sensor. It has a 100% coverage 3.2-inch 1.04 million dot Intelligent ClearView II LCD viewfinder that can display a variety of shooting information. The jury also pointed out that the camera sports a 150,000 pixel RGB-IR metering sensor that utilizes EOS iTR (Intelligent Tracking and Recognition) AF and that AF performance is enhanced by the 61-point high-density reticular sensor. Selected for this year’s “Best Photo / Video Professional Camera” award, Canon’s EOS-1D X Mark II flagship-model DSLR offers impressive specifications. The camera is equipped with an approximately 20.2 megapixel 35 mm full-frame Canon CMOS sensor and achieves high-speed continuous shooting of approximately 14 fps, and up to 16 fps in Live View mode. The TIPA judges noted that the Dual DIGIC 6+ image processors enable high-speed writing of up to 170 RAW images and 81 RAW+JPEG images per burst. Thanks to Dual Pixel CMOS AF, in which all of the CMOS sensor’s pixels include both imaging and the phase-difference detection AF functions, the EOS-1D X Mark II is capable of high-speed AF tracking. The camera features an improved 61-point viewfinder AF and an improved AI Servo III+ predictive AF algorithm, and also achieves 4K 60p video shooting, and Full HD 120 fps high frame rate image capture suitable for slow motion video capture. With the optional Wireless File Transmitter WFT-E8B, compatible with the new IEEE802.11ac wireless LAN standard, data can be sent wirelessly at high speeds across the 5 GHz band. Crowning the IXUS 285 HS “Best Easy Compact Camera,” the TIPA judges declared, “Canon continues to offer pocketable yet full-featured compacts that offer many more options and higher photo quality than camera phones.” The camera sports a 12x optical zoom lens with built-in image stabilizer, a dedicated Wi-Fi button and NFC for enhanced connectivity, and a 3-inch LCD screen. It boasts an approximately 20.2 megapixel CMOS sensor and DIGIC 4+ image processor that achieves high image quality even in low-light environments. What’s more, it can capture 1080p Full HD video and, using Canon’s proprietary algorithm, can produce a “highlight reel” in camera from selected albums. Crowned “Best Expert Compact Camera,” Canon’s PowerShot G5 X features a 1-inch approximately 20.2 megapixel High Sensitivity CMOS sensor and DIGIC 6 processor that achieves an approximately 6 fps continuous shooting speed and Full HD video. The camera features a 24–100 mm (35 mm film equivalent) 4.2x optical zoom lens with a nine-blade iris and an aperture of f/1.8 at the wide-angle end and f/2.8 at the telephoto end that achieves rich tonal gradations and exceptional blur characteristics across the entire zoom range. The G5 X features an EVF (electronic viewfinder) with approximately 2.36 million dots and approximately 100% coverage that employs an organic EL (electroluminescent) panel and has a refresh rate of up to 120 fps. A built-in eye sensor, which has a range of approximately 22 mm, can even detect users wearing glasses and switches display from the EVF to the 3-inch vari-angle LCD touchscreen. Additionally, the camera’s hot shoe is compatible with all Speedlite flashes in the EOS system. “Combining the ease of desktop use and a 17-inch wide cut sheet printer with many features from Canon’s higher-end pro printer models,” the imagePROGRAF PRO-1000 earned the title of TIPA’s “Best Photo Printer.” It incorporates a new twelve-color LUCIA PRO ink system, with eleven pigment inks, including the newly formulated Photo Black, and Chroma Optimizer. What’s more, Photo and Matte Black have their own nozzles, so no switching is needed between print jobs. Equipped with the air feeding system found in Canon’s large-format imagePROGRAF inkjet printers, the PRO-1000 virtually eliminates paper skewing, regardless of paper weight and type, while also achieving more accurate ink placement. A new print head expels more ink droplets per second for more stable print performance, and print head-mounted sensors can detect clogs and automatically delegate printing responsibilities to other nozzles to prevent discoloration.